A group of protesters gathered at north-east supermarkets to campaign against the use of plastic packaging. Campaigners aiming to reduce plastic waste are to hold a protest at a north-east supermarket. A supermarket giant has handed a north-east charity a cash boost to build a new playpark. Supermarket Morrisons has posted a hike in annual underlying profits despite a slowdown in retail sales as Brexit uncertainty knocked shoppers’ confidence. Supermarket Morrisons is expected to ring up a hike in annual profits on Wednesday as its wholesale arm helps it weather the impact of a tougher consumer backdrop. Morrisons applied to Aberdeen City Council to create an enclosed storage area in the footprint of their existing store on the city’s King Street. Convenience store retailer McColl’s has reported a sharp drop in profits, blaming the collapse of groceries wholesaler Palmer & Harvey in a “challenging” year for the group. A man has been injured after a crash in a supermarket car park in Aberdeen. A north-east supermarket is doing its bit to support homeless youngsters by launching a “rainbow rose” this Valentine’s Day. A serial shoplifter who warned staff in a north-east town not to come near him unless they “want slashed” has been jailed. Woolworths, “Raggie” Morrisons and Falconers will all feature. A serial shoplifter has been given a supervision order after admitting stealing jewellery, alcohol and an amplifier speaker from various shops. A supermarket chain will offer a “quieter hour” at its stores in the north-east for customers who struggle with noise sensitivity. A north-east supermarket has helped contribute to raising £5 million in less than 18 months for its charity partner. A popular brand of haggis pakora has been recalled over fears it could contain shreds of plastic. 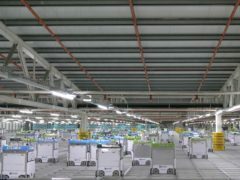 Here’s a glimpse inside a warehouse for online supermarket Ocado where hundreds of robots can be seen whizzing around picking groceries for customers. A dairy farm is hoping to become a household name after hitting shelves in supermarket giant Morrisons. Concerns have been raised by members of a community where a fast food giant plans to create a new drive-thru facility.